Locate the DMC using Google Maps. If you are traveling to the IRIS DMC, either for the first time or for a return visit, we would like to provide you with these travel tips. Please contact Gale Cox for any questions or further information. Be sure to plan ahead! Because of our close proximity to the University of Washington and downtown Seattle, the hotels in the area are often booked- especially during the summer months and early fall. There are several options to choose from regarding transportation to your hotel or to the DMC from the airport. With the completion of the Light Rail system, visitors can now take the train from SEATAC airport to the Husky Stadium Light Rail Station. The SeaTac/Airport Light Rail Station is connected to the fourth floor of the Airport Garage. Trains arrive and depart on the platform level of the station. The walkway to the Airport Terminal is one level down on the mezzanine. The walkway is separated from the main area of the garage and directional signs point the way to the Main Terminal sky bridge. The Link light rail service runs from 5 a.m. to 1 a.m. on Monday through Saturday and 6 am to midnight on Sundays. Trains arrive and depart every 7 1/2 to 15 minutes, depending on the time of day. Fares run between $2.25 and $3.00. Tickets can be purchased from the vending machines on the platform level of the station and must be in hand prior to loading the train. Get off on University Way at the Buffalo Exchange shop (stop #9584 on OneBusAway). The DMC is located on NE45th St in the white Wells Fargo Bldg on the corner of 45th and University Way. Enter the DMC from the north side of 45th through the first door east of University Way. Use the elevated walkway to cross Montlake Blvd., head NW toward the campus. Take a Left on NE 45th Ave. The DMC is on the right side of NE 45th Ave. Shuttle Express (206-622-1424) is about $38 one way. Yellow Cab (206-622-6500) is about $60 one way. For more information on the Light Rail, taxi and bus service see the SEATAC airport web site. Take the Main Airport exit towards Interstate 5 North (a left hand exit). Follow I-5 north for about 15 miles (you will pass through downtown Seattle - enjoy the view!). Take the NE45th/50th Street exit. Stay to the right upon exiting and make a right (east) turn onto NE 45th Street. 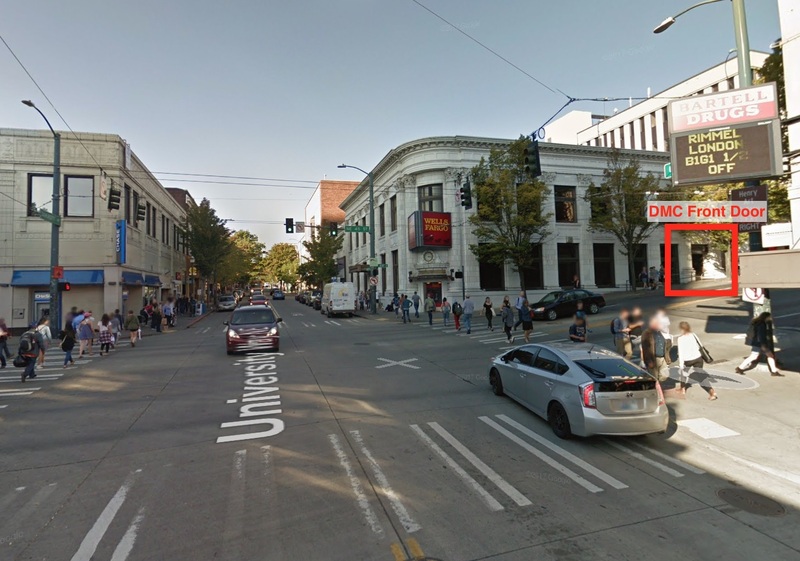 The DMC is located 8 blocks east on the NE corner of 45th and University Way in the Wells Fargo Bank Building. Enter the DMC from the north side of 45th through the first door east of University Way. Pay parking is available at the NE and NW corners of 15th Ave (just east of the DMC entrance) as well as many other places in the University District. There is also metered, street parking. 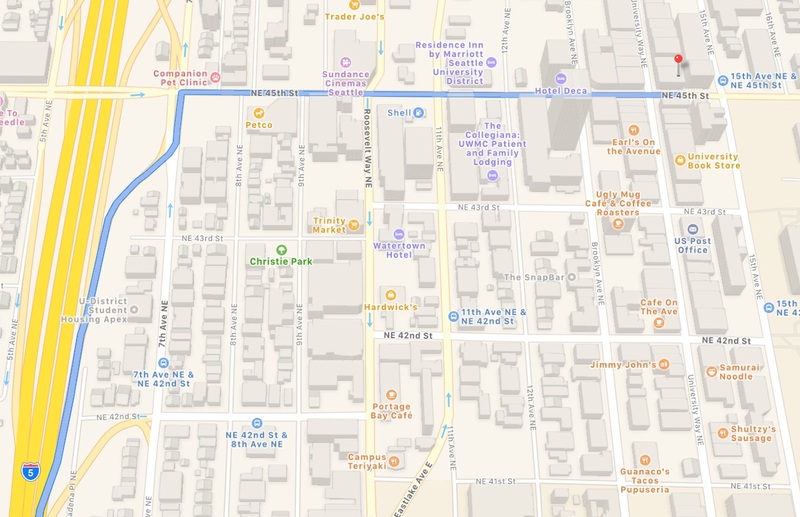 From NE 45th Street, take a right onto Roosevelt Ave (one way street 4 blocks east of exit) and go 3 blocks south - the hotel is on the left hand side. From NE 45th St., take a right on to Roosevelt Ave. Hotel is 1 block south on the left. From NE 45 St., stay straight to 12th Ave NE. take a left onto 12th Ave NE. Hotel will on the left. Continue on NE 45th Street (past the DMC and the University of Washington entrance) down the steep hill and onto the overpass. At the bottom of the overpass you will take a right-hand "roundabout" exit onto 25th street (north). The hotel is a few blocks up on the right - just past the University Village shopping center. The hotel has a free shuttle to near-by addresses (3 mile radius). If none of these hotels meet your needs please let us know and we will try to find other accommodations (although they will more than likely not be within walking distance of the DMC).